Today we’re hearing from award-winning graphic and type designer, Laura Meseguer. Based in Barcelona, Laura works on projects involving custom lettering, and type design, for branding and publishing design. She has her own type foundry, Type-Ø-Tones, as well as an online store, Tipofino, and has written a book, TypoMag. Typography in Magazines, as well as co-authoring the book, Cómo crear tipografías. Del Boceto a la pantalla. Laura will be speaking at the second #tptalks for 2018. To join us, please register here. Your work spans both type design and expressive lettering. Does doing one of these help you feel you are ‘taking a break’ from the other? Do you enjoy exploring how these two disciplines can overlap? (i.e. typefaces that behave like lettering). Laura Meseguer: Somehow yes, especially when considering the timing, the processes in type design are much longer, and combining it with lettering makes my work much more diverse. At the creative level, they provide feedback for each other. Normally I mostly work combining commissions (type design & lettering) with self-initiated typefaces, but recently I decided to take a break, also from teaching, and get hands-on in printing techniques. I did this at the AGA LAB in Amsterdam. There, I not only worked on applied lettering but in a self-made ‘letrazine’. It has been very rewarding in many aspects. I used to like to plan ahead, but I learned to stay flexible because so many unexpected things happen. I find it to be the best way to avoid unnecessary stress and mostly frustration. 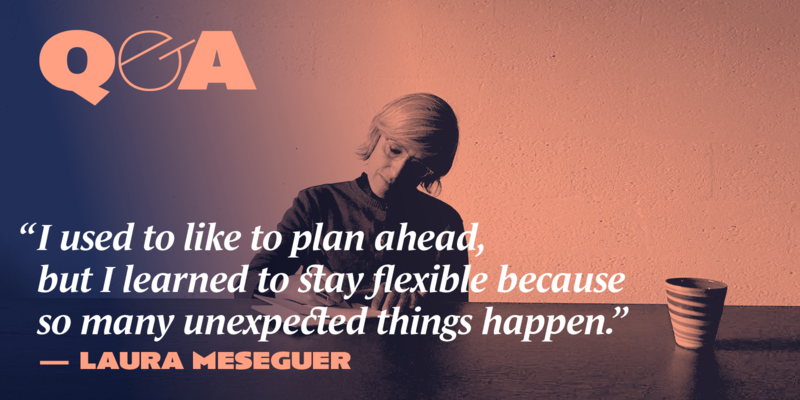 I used to like to plan ahead, but I learned to stay flexible because so many unexpected things happen. Along the last years I adopted a pretty nomad life. I always travel with my laptop and drawing materials, but I always try to get a dedicated workspace, a place with a bigger extra screen and a desk. I guess the passion I have for my profession, that allows me to express myself.